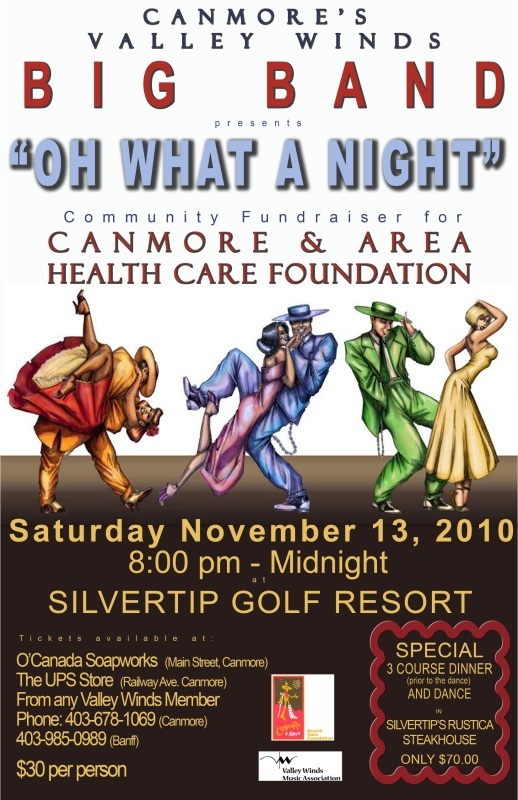 The Valley Winds Big Band in Canmore is presenting their “Oh What a Night” Big Band Dance November 13, 2010. Come out to the Silvertip Golf Resort and dance the night away. Tickets $30 – available from any Valley Winds player, The UPS Store (Canmore) and O’Canada Soapworks (Canmore), or phone 403-678-1069. Better yet, come early to the Silvertip Rustica Steakhouse and enjoy a three-course dinner plus the dance for $70. 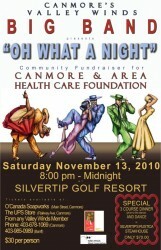 All proceeds of the dance go to the Canmore and Area Health Care Foundation. This is a great opportunity to enjoy an entertaining evening while supporting an important local cause. Directions to Silvertip Golf Course: From Calgary, in Canmore exit right at the Canmore Town Centre exit. Take a right a the stop sign and a left at the Hotel of the Rockies. Take Silvertip Trail up the mountain (5 minutes) to its termination at the Timbers Clubhouse.